Proteins represent the major bulk of our dry body mass together with lipids and bones. Proteins are behind our engines (muscles) and determine the inner and outer shape of our body. They perform most of the metabolic biochemistry that keeps us alive and lets us grow from a tiny baby to an adult. When something goes wrong with an important protein then often a disease of some kind is the consequence. As a matter of fact quite a number of proteins are so tightly linked to certain diseases, that they are actually used as biomarkers to detect the diseases in blood or tissue probes of patients. There are two major ways changes of proteins contribute to disease development and persistence: Either a totally normal protein gets diminished (all the way from a little to total loss) or alternatively increased (too much of a good thing). Or the protein itself is changed resulting in either a loss of function or a gain of a harmful function as is the case in many cancer-promoting mutations. Looking at all (or rather a large number) of proteins simultaneously is called proteomics. What is the major result used in personalized medicine? 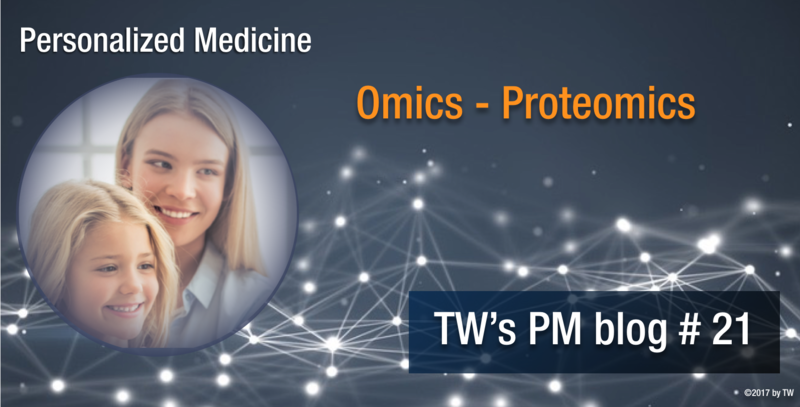 Proteins as biomarkers are used in two ways: Quantitative measurements (such as the C-reactive-protein level in blood, where an increase indicates an infection) or detection of aberrant forms such as so-called “oncogenic” variants. Knowing which proteins changed in which way is great help for the precise diagnosis of a disease. Often this also helps to select the optimal therapy based on the protein results. Which body samples are required to carry out the experimental analysis? Usually body liquids (blood, saliva,urine, even sweat) or tissue biopsies are the main source from the patient. Which basic technologies are behind this -omics? The detection of proteins is usually based on one of two approaches: The first is immunology-based, i.e. each protein in question os recognized by a specific antibody, and either marked directly by that antibody or immobilized by it to a detection device (such as a glass slide). The identification of the proteins is then done in a second step. The other bunch of methods goes directly after the proteins themselves, e.g. 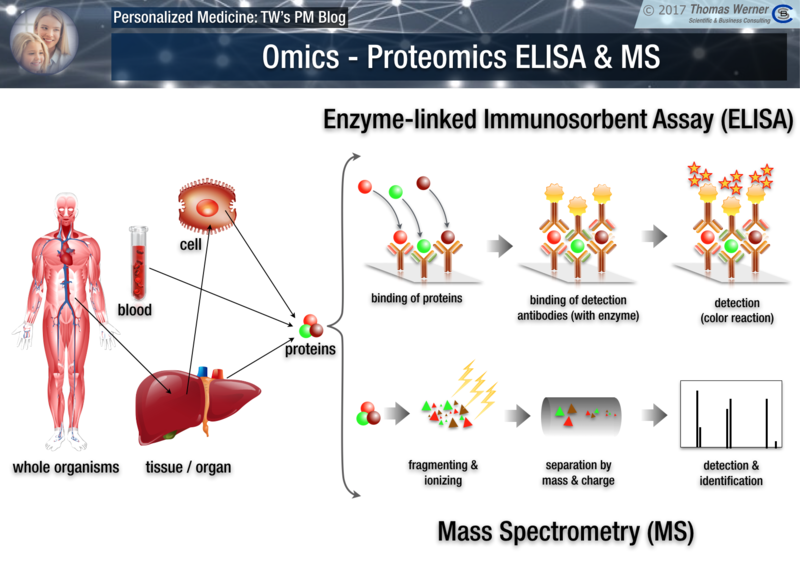 in mass spectrometry (MS) where a whole mixture of proteins is broken into smaller parts, called peptides that are then directly identified via their molecular mass and properties in the MS. This way thousands of proteins can be analyzed simultaneously. What are the most likely next advances and how would they improve application for personalized medicine? Large-scale proteomics is still hampered by the enormous effort required as compared to DNA/RNA based methods. However, especially MS-based approaches are getting better and better to close this gap in efforts. This will most likely allow carrying out large-scale proteomics screenings on man patient probes. Since there is a whole bunch of regulation happening between transcription and the measurable proteins this kind of information is very important and fully complementary to DNA/RNA based approaches. Next week the focus will be on metabolomics, all the chemistry our bodies perform so elegantly on a daily basis. However, also here things can go wrong and cause diseases.